Here are the latest teaser's from bundle Monster and Cheeky Beauty =D. Sorry I haven't posted these sooner... I'm currently recovering from the flu =(. First we have Teaser Image Plates BM321 & BM322 from Bundle Monster. I really love the ribbon full nail Image =D. These plates will be available to buy in a week or 2! 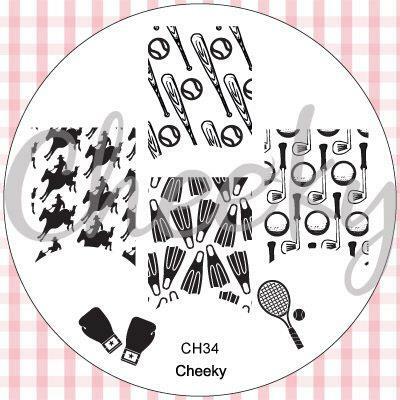 Next we have some treats from Cheeky Beauty. really stepped up their game =D. This set is due out, late May - Early June. Omg I'm in love with *Teaser* Image Plate CH48. It left me speechless when I first saw it! Which Teaser do you like best? The fireworks / pain spatter image looks cool. I am really excited for the cheeky plates. I just ordered the spring collection last week and can't wait to recieve them. I will definitely be getting the summer one when it comes out! !